Search for Caroline Herschel in CBW. Find Caroline Herschel on the Pop Chart. Caroline Herschel’s father, Isaac Herschel, was the son of a landscape-gardener to the King of Saxony. Rather than following in his father’s footsteps Isaac pursued his passion for music, becoming an oboe player in the Royal Hanoverian Band in 1731 at the age of twenty-four. The next year he and Anna Ilse Moritzen were married; and her very traditionally-minded family background, especially concerning the role of women, would later have an impact on their daughters. The Herschels' still-growing family was disrupted in 1743 by the Battle of Dettingen, in which Isaac fought, and from which he returned with an acute rheumatism which would weigh on his health for the remaining years of his life. Two years later, however, Caroline Lucretia was born in Hanover—the fourth of six children. All the children, except the eldest daughter Sophia Elizabeth, very early exhibited distinct musical talent, but Caroline's gifts in that direction were almost entirely neglected—writing and reading being, in her mother's estimation, the only necessary accomplishments for a woman. During her father's lifetime he supplied her with occasional lessons on the violin, and to him may be traced the musical and scientific tastes which distinguished his children. When asthma and rheumatism finally necessitated his retirement from the army in 1760, it was his great delight to discuss musical and scientific matters with them; but after his death in 1762 Caroline was entirely relegated to the kitchen, and to the manifold duties which accrue to a servantless household. 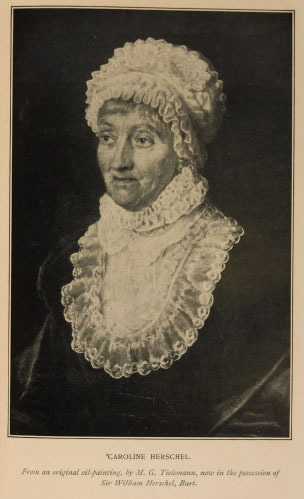 But Caroline Herschel never thought of herself; she had a "royal instinct for serving others," and to be useful in the narrow sphere of a modest German home was as much a religion to her as was afterwards the loving service which she devoted to her brother in England. Entirely devoid of self-consciousness, with an hereditary spirit of discipline running in her veins, united with an instinctive love of self-sacrifice for the sake of duty, there is a nobility and a "divine enthusiasm" about Caroline Herschel which invests all her deeds with an enduring grandeur which she herself would have sincerely deprecated. For many years the daily routine of cleaning and cooking and knitting went on, but at last the relief came, in the shape of a request that was almost a command, from her beloved brother William, that she should go back with him to England, where he had been promoted from Halifax parish church to the post of Organist to the Octagon Chapel at Bath, then recently consecrated. In August 1772, at the age of twenty-seven, Caroline landed on English shores at Harwich. …At the time of her arrival in England she could only read and write, so we may well believe that it was with mingled delight and diffidence that she entered upon her new life at Bath. From being a maid-of-all-work in Hanover to being the coadjutor of a man like William Herschel was indeed a change which our imagination "boggles at"; and had she been a woman of less heroic mould, she might have given herself up to alternate moods of exaltation and despair, without our feeling any reasonable wonder. But Caroline was made of true Teutonic stuff, and this was soon made manifest in her everyday life with the "Hanoverian fiddler" whose scientific discoveries and deductions subsequently electrified the whole civilised world. Seven years his junior, disliking publicity, and a "hausfrau" bred if not born, it is simply amazing to watch the loyalty and devotion with which she followed and smoothed every step of the path which her brother elected to pursue. Strait was the gate and narrow was the way, but no stumbling-block was allowed to interfere, no difficulties discouraged. An innate spirit of obedience enabled her to perform what seem almost like miracles; and the young woman whose acquirements would now be sneered at by many a girl in her teens, was thereby made capable of carrying through schemes, both musical and scientific, which at first sight must have seemed well-nigh impossible, had such a word ever occurred to her in connection with any of her brother's desires or designs. On Sundays she received her weekly housekeeping money, accompanied in early days with due directions as to "debit" and "credit"; and, after six weeks in England, she was trusted to go marketing alone, though her brother Alexander, then in England as well, generally hovered at no great distance, in case she should find any insuperable difficulty in making known her requirements. William was now making a considerable income by concerts, compositions, teaching, and organ-playing, and for a time her attention was principally devoted to making herself of service to him in the musical world. By diligent practising, she made herself equal to performing in oratorios and concerts with no inconsiderable success, the only stipulation which she ventured to make being that, only when William was conducting should she be asked to do so. The marvellous activity of those first ten years may be guessed from the fact that William Herschel was giving from thirty-five to thirty-eight music lessons every week, and that during this time Caroline persevered in her novel duties—practising, performing, and copying scores, just as directed by the beloved brother. She saw and heard nothing save through him; but it is evident that, had self-aggrandisement been ever in her thoughts, she might have made for herself a permanent position in the musical world. For, incredible as it may appear, she was soon counted worthy, even by such stern critics as her own brothers, to take the part of leading treble in oratorios; and the fashionable leaders of Bath society were loud in their praises of her voice and manner. This admiration, however, was not reciprocated, and, in her blunt German fashion, she denounced the ordinary young ladies as "very little better than idiots." But the poor little prima-donna housekeeper had by no means exhausted her duties when she returned weary and jaded from a long evening of responsibility and exertion in the crowded concert-rooms of Bristol or Bath. Music to William was but a means to an end, and that end was Astronomy. Unconscious of fatigue himself, he seems to have lost all count of time when bent upon solving some of the mighty mysteries of infinite space; and his sister's aid was found invaluable. He had tested his brothers, but had found them wanting; and her obedient zeal in helping forward all his schemes made him realise that here, at last, was one upon whose deftness, adaptability, and strenuous help he could confidently depend. Night after night for eight years they worked together—calculating, measuring, mirror-grinding, examining, writing memoranda,—and not until daylight had chased away the stars did she allow herself to be tired. Never was a man of science so favoured in his assistant. Alexander, though both musical and mechanical, had no perseverance; and, while his 'cello solos were "divine," he lacked the steady fixedness of purpose which would have raised him to the first rank of public performers. It was Caroline, therefore, on whom William relied for help in the construction of tools, for grinding and polishing. "Logarithms made easy" is a book which has yet to be written; but with these also Caroline had to be conversant, as well as with mathematical problems of which her ready brain had to assimilate the working, while her tiny hands dispensed the frugal meals. Sometimes William used laughingly to make her forego part of her dinner if she could not describe the angle of the piece of pudding which she was cutting. She it was who fashioned the pasteboard model of the tube to hold the first large telescope, and her dexterous fingers and eager longing to be of service made her—as, with a touchingly proud modesty, she herself expresses it—"almost as useful as a boy." At one stage of fashioning a reflector it is necessary for the workman to remain for many hours with his hands on the mirror. On one occasion William never stirred for sixteen hours, his sister meanwhile feeding him and reading to him, ready at any minute to obey his slightest wish. At such times as these she read aloud the novels of Sterne and Fielding, and the gorgeous stories of 'The Arabian Nights'; but the fairy tales of science were all their own, and we can fancy that silence would often fall between them as they speculated upon the wonder-lands of the moon with its flame-breathing craters, the mazy labyrinths of the "Milky Way," or the faithful satellites of Saturn. And she never failed him. In all his work she was his veritable "alter ego." In winter nights, when the ink froze upon her pen, she still was by his side—in garden or in garret—helping him to do work which, without her, would have been well-nigh impossible. As in music so in astronomy- her one idea was, "All I am, all I know, I owe to him. I did nothing for my brother but what a well-trained puppy-dog would have done: that is to say, I did what he commanded me. I was a mere tool, which he had the trouble of sharpening." Here, between the lines, we can read the faint, underlying bitterness with which she looked back upon her neglected education. In a note to her nephew (afterwards Sir John Herschel) she says, "My only reason for saying so much of myself is to show with what miserable assistance your father made shift to obtaining the means of exploring the heavens." This was her own self-estimate; ours is far different, and so we are convinced was his also. He might have discovered scores of planets; but, had he not appreciated her skilful help, he would nevertheless have been a contemptible cur. For some years they lived at 7 New King Street, but for the sake of better accommodation in 1779 they removed to No. 19, where, on the 13th of March 1781, William discovered the planet Uranus. In spite of the most careful frugality, all this while they had still found it impossible to give up the earnings derived from music; but the time was nigh, even at the door, when organ and oboe should be put aside, and when science, the first love of William Herschel's life, should reign preeminent over the lives of both brother and sister. They made their last public appearance together, on the Whit-Sunday of 1782 at St Margaret's Chapel, Bath,—the anthem, in which Caroline sang, being composed and conducted by William himself. Henceforward, astronomy was their only care and study; though, when her allotted threescore years and ten were long past, Caroline was constantly to be seen at the concerts in Hanover, and the "little old lady" was a familiar figure in the stalls of the opera-house. It was in August 1782 that, through the influence of His Majesty George II., the Herschels left Bath for Datchet, William having been created Astronomer-Royal, with a salary of £200 per annum. It was a post that brought with it more honour than honoraria; but money with the Herschels had never been plentiful, and the deceitfulness of riches was to them an unknown danger. They cheerfully determined to live upon eggs and bacon, and set to work upon the construction of that wonderful 40-foot telescope which swept the heavens with such unthought-of results. Recognising her share in its construction with gratitude and astonishment, we see in it a monument of unremitting industry and endurance, such as dwarfs all other astronomical instruments into insignificance, and her woman's wit doubtless supplied suggestions as to ways and means, and expedients which would not have occurred to the less practical mind of her brother. Hers is not a solitary instance of deliberate self-effacement, but the world will never know how much more than the mere discovery of eight comets was due to the tireless energy and unselfish adaptability of Caroline Herschel…. One winter's night, when the snow lay a foot deep upon the ground, they were examining stars outside the house. She was hurrying to a little distance from the telescope to make some special observation when she fell heavily upon an unseen butcher's hook, which penetrated deeply into her leg. "Make haste, Caroline," came his voice across the dark whiteness. "I can't, William, I'm hooked," was the feeble answer; and when, with much difficulty, the bleeding limb was extricated, nearly two ounces of flesh had to be left behind. Even then her only thought was of him, and her only comfort amid the pain was that, as clouds were coming up rapidly, she had not materially hindered his night's work. "You have immortalised your name, and you deserve such a reward from the Being who has ordered all these things to move as we find them, for your assiduity in the business of Astronomy, and for your love for so celebrated and so deserving a brother." A salary of £50 per annum was now granted her as "assistant" to the Astronomer- Royal, and in 1787 she received "the first money that ever in all my life I thought I could spend as I liked." We find from another entry in her Diary that she had been accustomed to put down her little personal expenses in her brother's account-book as "for Car. "; but that, since leaving Bath, they had never exceeded £8 per annum. Such a statement is too touching in its simple honesty to need comment; but in these days, when the papers think it worth while to discuss the question as to whether £100 per annum is a niggardly dress allowance, we can but admire, and wonder, and adore! The Herschels received at their home many aristocrats and other distinguished persons desiring to see their telescope and to make the acquaintance of the Royal astronomers, among whom were the Prince of Orange and the Princesse de Lamballe. But the happy days of solitude à deux, as the French prettily call it, were now drawing to a close, and it was another woman's hand that was destined for many a long day to darken the happiness of the devoted little sister. On the 8th of May 1788 William Herschel married Mary, only child of James Baldwin, and widow of Mr John Pitt. For sixteen years Caroline had devoted herself to him with an identity of interest and a supreme self-sacrifice, unique even among the histories of unselfish women; and we can almost see the tear-dimmed eyes and quivering fingers with which she made the last entry in her Journal of that year, "I gave up my place as housekeeper." We cannot doubt that expostulations ensued, and that propositions were made that she should continue to live at Collingwood; but she was no longer needed—there lay the sting. Through evil report and good report she had never thought but of him, and now another was to enter into her kingdom. That the bride was gentle and amiable, and that she brought with her a jointure which enabled her husband to experiment still more unfetteredly, did not make the blow any less hard for Caroline to bear; and, in the destruction of all her personal papers from 1788 to 1798, we can see plainly that she thought it best to destroy what in the very anguish of her soul she had written. In after years she learned to love and esteem her sister-in-law, for her own sake as well as for the sake of him whom both loved so dearly. "I gave up my place as housekeeper"—the sorrowful undertone is in every word of the brief entry—but she reserved to herself the right of access at all times to the roof of her brother's house, the observatory, and the workroom. Hither she came daily, returning for her meals to the Spratt ménage. When the family were away she used to go and stay in the house, looking after the interests of him whom she loved so well; but there is a profound melancholy in an entry in her Journal made on one of these occasions, "All came home; and I went to my solitude again." Her "Book of work done" shows no decrease of mental or physical activity, but the contrast between her own small lodging and the happy home-life so near, from which, rightly or wrongly, she felt herself debarred, must often have been very bitter. Within a stone's-throw was all that she most cared for, brother and nephew—the little John Herschel, born in 1792, who in after years inherited the love which she had lavished upon his father, and the genius which enabled him to sweep the southern hemisphere, from his observatory at Feldhausen, with the same earnest assiduity which had characterised his father and his aunt in their northern surveys. Of this South African Expedition she exclaimed in her vigorous Anglo-German, "Ja, if I was thirty or forty years younger and could go too! In Gottes Namen!" "Bills and receipts for my Comets" is the quaint way in which she docketed her memoranda relative to these erratic phenomena, for five of which, at least, she could claim undisputed priority of discovery. The most laborious of her undertakings, however, was a catalogue of all the star-clusters and nebulae observed by her brother, and it was for this that the gold medal of the Royal Astronomical Society was voted to her in 1828, followed by the extraordinary distinction of an honorary membership. This catalogue was the outcome of many years of labour, but it was a labour of love, as being the corner-stone in the temple of his fame. The Royal Family showed much attention to the clever Herschels, and there are several entries in her Diary as to days at Frogmore and dinners with the Queen. She was under some anxiety at this time as to her eyes, but the oculist having reassured her, she continued her work with unabated interest. Her constitution must have been extraordinarily good, for though the strain upon it for many years must have been excessive, she never spent a day in bed from 1761 to 1821. She is but another illustration of the truth of Bacon's aphorism—"One of the rewards of philosophy is long life." That her brother should die before her does not seem to have entered into her calculations, and, with a view to her death, she made all arrangements for simplifying matters for her survivors; but the love of living was still strong in Caroline when, in 1822, the tie of more than fifty years was for ever broken, and William Herschel, full of age, wisdom and honour, saw the sun set for the last time on earth, and woke to find himself beyond the stars. It was when stupefied with grief that Caroline took the fatal step of making over herself and all her little capital to the care of her younger brother, Dietrich. What was at the root of her action we can only guess. Possibly she had some sort of craving to take up once more a place in the home of her childhood, and hoped to bury her sorrow in associations that would be both old and new…. "A few books and my sweeper" is the pathetically brief inventory of her possessions at this time; and her only capital, £500—the savings of fifty years of toil—she transferred to Dietrich, thus giving herself no possibility of retracting her determination of leaving England for ever and settling in Hanover with him. Little did she expect that twenty-five years more of life would be given her, in which to chafe against the narrow interests of that small German town. After the width and wisdom which she had enjoyed in "happy England" the monotonous flatness of her life was almost unbearable. Her nephew's advice had been all against her going, and deeply did she regret her hasty action, as the long years passed uneventfully by. But she had "burned her boats," and retreat was impossible. Dietrich, who knew his own inferiority, despised the sister whose perspicacity had not been equal to seeing it also. She made up her mind to endure, thinking that she must soon die; but Death—who claims so many unwilling followers—seemed to have forgotten her, and home-sick, lonely, and sad, she rusted there for another quarter of a century. Her books and telescope she sent back to England shortly after her arrival in Hanover, as she soon had reason to fear that Dietrich's extravagant habits might induce him to sell them after her death…. Till 1827 she lived with, and nursed, this fractious and ill-conditioned mortal—of whom she says, "I hardly ever knew a man of his age labouring under more infirmities, nor bearing them with less patience." Then her patience and his impatience alike ended, and he went to his own place…. After Dietrich's death she removed to 376 Braunschweiger Strasse, where, with her confidential servant Betty, she lived for fifteen years in an eventide that had in it some faint after-glow of the days that were gone. "Plate. Ha! ha! ha! ha! "Requisites for self and servant, mostly bought at fairs. "Cane-bottomed chairs, each valued at eighteen-pence" (of which she says proudly, "after seven years' use, like new"). "About fifty books, and a few tea-things." At the age of eighty-eight, in one of her merry moods, she put her foot behind her back, and scratched her ear with it! This astounding acrobatic feat beats the record as far as we are aware! But apparently it created no great surprise, for Sir John Herschel says of her only a year or two earlier, "In the morning she is dull and weary, but as the day advances she gains life, and is quite fresh and funny at 10 P.M., and sings hymns, nay, even dances, to the great delight of all who see her." Within four days of her death, in reply to General Halkett's message that he hoped soon to come and give her a kiss, as he had done on her ninety-seventh birthday, the dear old lady looked up quite saucily and said, "Tell the General that I have not tasted anything since that I liked so well." Her characteristic fortitude never forsook her, but at last she "fell asleep," and on the 9th of January 1848 she joined her brother in that land where no sun, no moon appeareth, where no shadow ever falls. In the old garrison church where she had been baptised ninety-seven years before, the burial service was read over the body of Caroline Lucretia Herschel. Garlands of laurel and cypress covered the coffin, and within it, at her express desire, were buried with her a lock of her brother William's hair, and an old almanac which had belonged to her father. An abridgment of “Caroline Herschel” in A. J. Green-Armytage, Maids of Honour: Twelve Descriptive Sketches of Single Women Who Have Distinguished Themselves (1906), 68-101. Agnes Mary Clerke, The Herschels and Modern Astronomy. London: Cassell & Co., 1895. Agnes Mary Clerke's book about William and Caroline Herschel's impact on the field of astronomy. A chapter of the text is devoted to a biography of Caroline Herschel and her scientific achievements. This volume is part of The Century Science Series. Full-text edition includes the author's preface. Linked through Google Books. Greg Bryant, "The Comets of Caroline Herschel." Universe. May 1997. Astronomer Greg Bryant catalogs the comets found by Caroline Herschel as well as dates and discusses the circumstances of their discovery. From Bryant's article in Universe magazine, linked through his website. Maria Mitchell, "Maria Mitchell's Reminiscences of the Herschels" The Century. Vol. 38, 1889. Maria Mitchell, America's first professional female astronomer, writes about her relationship with the Herschel family and reflects upon Caroline's character and her work in science. Article linked through the About.com: Women's History website. Michael Hoskin, "Herschel, Caroline Lucretia (1750–1848)." Oxford Dictionary of National Biography. Ed. H. C. G. Matthew and Brian Harrison. Oxford: OUP, 2004. Online ed. Ed. Lawrence Goldman. Oct. 2005. Oxford Dictionary of National Biography entry on Caroline Herschel written by Michael Hoskin. This comprehensive biographical record includes a list of other sources and archive materials related to Caroline Herschel. Mrs. John Herschel, Memoir and Correspondence of Caroline Herschel. London: J. Murray, 1879. Mrs. John Herschel's biography about Caroline Herschel, which is based upon her journal and a book of "Recollections" from the years 1772 to 1778 that Caroline wrote privately for the Herschel family. This collected memoir also provides much of Caroline Herschel's correspondence. Included is an Introduction by Mrs. John Herschel, as well as a note written by Caroline's neice, Mary Cornwallis Herschel. Full-text edition contains portraits of Caroline and her brother, William Herschel. Text linked through Google Books. The Herschel Museum of Astronomy. Website of The Herschel Museum of Astronomy, which includes a brief biography about Caroline Herschel.